The Catholic Church in India is part of the worldwide Catholic Church under the leadership of the Pope and the curia in Rome. There are over 19.9 million Catholics in India, which represents around 1.55% of the total population and the Catholic church is the largest Christian church within India. There are 174 dioceses in India organised into 30 provinces. Of these, 132 are Latin Catholic Church, 31 Syro-Malabar Catholic Church and 11 Syro-Malankara Catholic Church dioceses. Despite the small percentage, India has the second largest Catholic population in Asia after the Philippines, due to India's huge population. All the bishops in India, both Western and Eastern, form the Catholic Bishops' Conference of India, which was founded in 1944. The Holy See's representative to the government of India and to the Church in India is the Apostolic Nuncio to India. The diplomatic mission was established as the Apostolic Delegation to the East Indies in 1881. It was raised to an Internunciature by Pope Pius XII in 1948 and to a full Apostolic Nunciature by Pope Paul VI in 1967. San Thome Basilica in Madras Mylapore Latin diocese built in the 16th century by the Portuguese over the supposed tomb of St. Thomas the Apostle. Rebuilt in the 19th century, it is a place of worship and pilgrimage. Christianity reached India in AD 52 when Thomas the Apostle reached Muziris in Malabar Coast presently called as the state of Kerala. He preached Christianity in Eastern and Western coasts of India. These Saint Thomas Christians are known as Nasrani, which is a Syriac term meaning Follower of the Nazarene Jesus. The Christian community in India later came under the jurisdiction of Bishops from Persia. Historians estimate this date to be around fourth century. As a result, they inherited East Syriac liturgy and traditions of Persia. Later, when the Western missionaries reached India, they accused this community of practicing Nestorianism, a heresy that separates Christ's divinity from his human nature. However, many historians have rejected that the community was Nestorian and assert that this community was indeed practicing the Catholic faith in East Syriac traditions, before the arrival of European missionaries. Today, the continuity of this early Christian community is found in the Syro-Malabar Catholic Church, an Oriental Church in communion with Catholic Church, following East Syriac traditions. Friar Odoric of Pordenone arrived in India in 1321. He visited Malabar, touching at Pandarani (20 m. north of Calicut), at Cranganore, and at Kulam or Quilon, proceeding thence, apparently, to Ceylon and to the shrine of St Thomas at Maylapur near Madras. He writes he had found the place where Thomas was buried. Father Jordanus Catalani, a French Dominican missionary, followed in 1321–22. He reported to Rome, apparently from somewhere on the west coast of India, that he had given Christian burial to four martyred monks. Jordanus is known for his 1329 "Mirabilia" describing the marvels of the East: he furnished the best account of Indian regions and the Christians, the products, climate, manners, customs, fauna and flori given by any European in the Middle Ages – superior even to Marco Polo’s. The Diocese of Quilon or Kollam is the first Catholic diocese in India in the state of Kerala. First erected on 9 August 1329 and re-erected on 1 September 1886. In 1329 Pope John XXII (in captivity at Avignon) erected Quilon as the first Diocese in the whole of Indies as suffragan to the Archdiocese of Sultany in Persia through the decree "Romanus Pontifix" dated 9 August 1329. By a separate Bull "Venerabili Fratri Jordano", the same Pope, on 21 August 1329 appointed the French Dominican friar Jordanus Catalani de Severac (OP.) as the first Bishop of Quilon. (Copies of the Orders and the related letters issued by Pope John XXII to Bishop Jordanus Catalani (OP.) and to the diocese of Quilon are documented and preserved in the diocesan archives). In 1347, Giovanni de Marignolli visited the shrine of St Thomas near the modern Madras, and then proceeded to what he calls the kingdom of Saba, and identifies with the Sheba of Scripture, but which seems from various particulars to have been Java. Taking ship again for Malabar on his way to Europe, he encountered great storms. Another prominent Indian traveller was Joseph, priest over Cranganore. He journeyed to Babylon in 1490 and then sailed to Europe and visited Portugal, Rome, and Venice before returning to India. He helped to write a book about his travels titled The Travels of Joseph the Indian which was widely disseminated across Europe. In 1453, the fall of Constantinople, a bastion of Christianity in Asia Minor to Islamic Ottoman Empire; marked the end of the Eastern Roman Empire or Byzantine Empire, and severed European trade links by land with Asia. This massive blow to Christendom spurred the age of discovery as Europeans were seeking alternative routes east by sea along with the goal of forging alliances with pre-existing Christian nations. 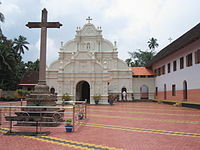 Along with pioneer Portuguese long-distance maritime travellers that reached the Malabar Coast in the late 15th century; came Portuguese missionaries who introduced the Latin Catholic church in India. They made contact with the St Thomas Christians in Kerala, which at that time were following Eastern Christian practices and were under the jurisdiction of Church of the East. In the 16th century, the proselytism of Asia was linked to the Portuguese colonial policy. The Papal bull – Romanus Pontifex written on 8 January 1455 by Pope Nicholas V to King Afonso V of Portugal, confirmed to the Crown of Portugal dominion over all lands discovered or conquered during the age of discovery. Further, the patronage for the propagation of the Christian faith (see "Padroado") in Asia was given to the Portuguese. The missionaries of the different orders (Franciscans, Dominicans, Jesuits, Augustinians, etc.) flocked out with the conquerors, and began at once to build churches along the coastal districts where the Portuguese power made itself felt. The history of Portuguese missionaries in India starts with the neo-apostles who reached Kappad near Kozhikode on 20 May 1498 along with the Portuguese explorer Vasco da Gama who was seeking to form anti-Islamic alliances with pre-existing Christian nations. The lucrative spice trade was further temptation for the Portuguese crown. When he and the Portuguese missionaries arrived they found no Christians in the country, except in Malabar known as St. Thomas Christians who represented less than 2% of the total population and the then-largest Christian church within India. The Christians were friendly to Portuguese missionaries at first; there was an exchange of gifts between them, and these groups were delighted at their common faith. During the second expedition, the Portuguese fleet comprising 13 ships and 18 priests, under Captain Pedro Álvares Cabral, anchored at Cochin on 26 November 1500. Cabral soon won the goodwill of the Raja of Cochin. He allowed four priests to do apostolic work among the early Christian communities scattered in and around Cochin. Thus Portuguese missionaries established Portuguese Mission in 1500. Dom Francisco de Almeida, the first Portuguese Viceroy got permission from the Kochi Raja to build two church edifices – namely Santa Cruz Basilica (Founded : 1505) and St. Francis Church (Founded : 1506) using stones and mortar which was unheard of at that time as the local prejudices were against such a structure for any purpose other than a royal palace or a temple. After four decades of prosperous trading, the missionaries started the proselytisation around 1540 and the newly founded Society of Jesus arrived in Goa. The Portuguese colonial government supported the mission and the baptised Christians were given incentives like rice donations, good positions in their colonies. Hence, these Christians were dubbed Rice Christians who even practiced their old religion. At the same time many New Christians from Portugal migrated to India as a result of the inquisition in Portugal. Many of them were suspected of being Crypto-Jews, converted Jews who were secretly practicing their old religion. Both were considered a threat to the solidarity of Christian belief. Saint Francis Xavier, in a 1545 letter to John III of Portugal, requested the Goan Inquisition, which is considered a blot on the history of Catholic Christianity in India, both by Christians and non-Christians alike. The death of the last metropolitan bishop – Archdeacon Abraham of the Saint Thomas Christians, an ancient body formerly part of the Church of the East in 1597; gave the then Archbishop of Goa Menezes an opportunity to bring the native church under the authority of the Catholic Church. He was able to secure the submission of Archdeacon George, the highest remaining representative of the native church hierarchy. Menezes convened the Synod of Diamper between 20 and 26 June 1599, which introduced a number of reforms to the church and brought it fully into Catholic Church. Following the Synod, Menezes consecrated Francis Ros, S. J. as Archbishop of the Archdiocese of Angamalé for the Saint Thomas Christians; thus created another suffragan see to Archdiocese of Goa and Latinisation of St Thomas Christians started, against the wish of St Thomas Christians (East Syrian Tradition). The Saint Thomas Christians were pressured to acknowledge the authority of the Pope and most of them eventually accepted the Catholic faith, but a part of them switched to West Syriac Rite. Resentment of these measures led to some part of the community to join the Archdeacon, Thomas, in swearing never to submit to the Portuguese or to accept the Communion with Rome in the Coonan Cross Oath in 1653. Those who accepted the West Syrian theological and liturgical tradition of Mar Gregorios became known as Jacobites. The ones who continued with East Syriac liturgical tradition came to be formally known as the Syro-Malabar Catholic Church from the second half of the 19th century onward. The Diocese of Angamaly was transferred to Diocese of Craganore in 1605; while, in 1606 a sixth suffragan see to Goa was established at San Thome, Mylapore, near the modern Madras. The suffragan sees added later to Goa. were the prelacy of Mozambique (1612) and in 1690 two other sees at Peking and Nanking in China. Missionary work progressed on a large scale and with great success along the western coasts, chiefly at Chaul, Bombay, Salsette, Bassein, Damao, and Diu; and on the eastern coasts at San Thome of Mylapore, and as far as Bengal etc. In the southern districts the Jesuit mission in Madura was the most famous. It extended to the Krishna river, with a number of outlying stations beyond it. The mission of Cochin, on the Malabar Coast, was also one of the most fruitful.Several missions were also established in the interior northwards, e.g., that of Agra and Lahore in 1570 and that of Tibet in 1624. Still, even with these efforts, the greater part even of the coast line was by no means fully worked, and many vast tracts of the interior northwards were practically untouched. Other than the St Thomas Christians, people of other faiths were converted zealously by the Portuguese. This started with Goa, then spread to Cape Comorin, inland districts of Madurai and the western coast of Bassein, Salcette, Bombay, Karanja, and Chaul. With the advent of suppression of Jesuits in 1773 the missionary expansion declined in India along with the need for organisations within the Church in India. Especially when the Vicar Apostolate of Bombay was erected in 1637 which was under the direct ruling from Rome, caused misunderstanding between the Portuguese missionary and the Apostolate. The Inquisition of Goa had caused strained relationship and mistrust with the Hindus of India. The strained relations between the Church and the Portuguese missionaries reached a climax when in 1838 the Holy See cancelled the jurisdiction of the three suffragan Sees of Crangaqnore, Cochin, and Mylapur and transferred it to the nearest vicars Apostolic, and did the same with regard to certain portions of territory which had formerly been under the authority of Goa itself. Finally in 1886 another concordat was established, and at the same time the whole country was divided into ecclesiastical provinces, and certain portions of territory, withdrawn in 1838, were restored to the jurisdiction of the Portuguese sees. A 2019 report by the Associate Press "uncovered a decades-long history of nuns enduring sexual abuse from within the church. Nuns described in detail the sexual pressure they endured from priests, and nearly two dozen other people — nuns, former nuns and priests, and others — said they had direct knowledge of such incidents." Concern with charity was common to Catholics and Protestants, but with one major difference: whilst the former believe that salvation comes from faith in God which manifests itself in good works such as charity, the latter could not rely on such a possibility, since they believe that only one's faith is a requisite of salvation, and that one's works are insufficient to gain or lose salvation. Consequently, Catholic charitable efforts in India have been extensive. In Portuguese India, for instance, Saint Francis Xavier and his fellow missionaries were especially careful to help the local charitable institutions by tending to the sick, both spiritually and physically, and performing other works of mercy. The Jesuits' educational institutions have left a prestigious impact through their education institutions. Education has become the major priority for the Church in India in recent years with nearly 60% of the Catholic schools situated in rural areas. Even in the early part of the 19th century, Catholic schools had emphasised on relief for the poor and welfare. ^ a b c d Factfile: Catholics around the world on BBC news. ^ "Statistics by Country". Catholic-Hierarchy.org. David M. Cheney. Retrieved 21 January 2015. ^ Catholic Bishops Conference of India on CBCI website. ^ Stephen Andrew Missick.Mar Thoma: The Apostolic Foundation of the Assyrian Church and the Christians of St. Thomas in India. Journal of Assyrian Academic studies. ^ Were these Christians infected with Nestorianism before 1599? on Catholic Encyclopedia entry on St. Thomas Christians. ^ Odoric of Pordenone (Nendeln, Liechtenstein, 1967), Henry Yule, trans. Cathy and the Way Thither vol. II ,P-142. ^ "Overview of Age of Exploration". Archived from the original on 9 July 2012. Retrieved 18 August 2012. ^ Britannica CD 97, S.V "Gama, Vasco da "
^ Mathias Mundadan, (1967), "The Arrival of Portuguese in India and Saint Thomas Christians under Mar Jacob"
^ a b Daus, Ronald (1983). Die Erfindung des Kolonialismus (in German). Wuppertal/Germany: Peter Hammer Verlag. pp. 61–66. ISBN 3-87294-202-6. ^ a b Synod of Diamper on Synod of Diamper Church website. ^ a b c d e India on Catholic Encyclopedia. ^ The Catholic Frontier in India; 16-17th century from The Free library. ^ "Archdiocese of Bombay". Catholic-Hierarchy.org. David M. Cheney. Retrieved 21 January 2015. ^ Sullivan, Tim (2 January 2019). "Report: Nuns in India have faced abuse for decades". AmericaMagazine.org. America Press Inc. Retrieved 15 January 2019. ^ a b Isabel dos Guimarães Sá Catholic Charity in Perspective: The Social Life of Devotion in Portugal and its Empire (1450–1700) Journal of Portuguese History. Vol.2, number 1, Summer 2004. ^ Catholic education in India The New York Times, 6 June 1887. ^ Card. Toppo: "Education is the Churches priority mission and key to Indian development" Asia News. ^ J. Hutching THE CATHOLIC POOR SCHOOLS, 1800 to 1845: Part 1 The Catholic Poor-relief, welfare and schools Journal of Educational Administration and History, Volume 1, Issue 2 June 1969 , pages 1 – 8. ^ "CCBI - The Conference of Catholic Bishops of India". ccbi.in. Wikimedia Commons has media related to Catholic Church in India. This page was last edited on 16 January 2019, at 04:57 (UTC).